London has long been one of the world's most vibrant, stimulating cities. Lively, multicultural, magnetic and idiosyncratic, it offers a seemingly endless number of singular pleasures, from the classic to the cutting edge. It's a city in which a deep sense of history and tradition coexists harmoniously with modernity and innovation; it's a global hub of fine art and literature, design and architecture, the performing arts, fashion and cuisine. Although London is one of the world's most frequented cities, many visitors don't experience all it has to offer, usually staying within a compact radius of a few miles that includes some well-known landmarks, a handful of museums and theatres, a department store or two, and maybe a chip shop for good measure. A Londoner's London is much more diverse than that, made up of distinctive neighbourhoods with individual sensibilities, each characterised by independently owned stores and restaurants, as well as residents with a strong sense of community. These days, neighbourhoods that were once too rough-and-tumble to attract the masses - such as Shoreditch, Hoxton, Dalston and Peckham - are thriving spots for shopping, strolling and most popularly, a leisurely brunch. Even in more established, centrally located areas like the West End, wonderfully discreet little boutiques and cafes frequently exist, tucked around corners and down tiny streets that many people don't know about. The goal of this series is to share the best of London's hidden gems and local's favourites. It's a compendium of it's most charming places, culled from years of exploring. First, exploding with vibrancy and life is one of my favourite areas of London, Shoreditch. Granted, I haven't quite sussed out if I'm edgy enough to show my face around there, but it doesn't stop me from taking the trip East fairly regularly. Told ya - edgy. Anyway, rather than churning out a 5,000 word love letter to Shoreditch, I thought it would be far more rewarding (for you) to read about the FIVE spots that I'd wholeheartedly recommend you all visit when in the area. Let's kick it off! There are currently nine Grind coffee shops in London, all completely different, but the first, and my favourite by far has to be Shoreditch Grind. All of the Grind's prove that there's far more to a coffee shop than just serving good coffee - although they definitely prove to do that very well too. Smack bang on Old Street roundabout, it's become a landmark in itself with it's distinguished exterior dominating Instagram feeds but it's now grown into a coffee shop that also dominates the London coffee scene. With an extensive menu, Grind is obviously synonymous with good coffee with the morning rush of lattes and flat whites but also caters for the after work desire of a buzzy espresso martini. Drinks aside, I was told by staff that they smash an unbelievable amount of avocados and poach an even more unbelievable amount of eggs across their sites each day. Grind focuses on seasonal, fresh and changing menus, featuring British, Australian and Italian cuisine. Despite being a chain, Shoreditch Grind still maintains to keep a very intimate, neighbourhood vibe with friendly staff and a great atmosphere that keeps people coming back time and time again. Or even better, camping out there all day. I, myself, have been guilty of taking my laptop there early morning to work, hapipily navigating my way through their delicious menu at the same time as my schedule. Flight Club is darts reinvented. It's honestly one of the most unique venues to hit London over the most recent years and has earned it's spot as one of the coolest social spaces in Shoreditch. All stereotypes to one side, Flight Club has somehow managed to make darts all 'hip n happening'. It sticks to its roots and keeps the authenticity of fairground fun throughout the venue with old school touches and fun memorabilia. With individual private ockeys for you to play in, which come with an automatic score-keeping system, you can play with your group or even link up screens with other groups in the venue to make it that bit more competitive. They call it social darts for a reason. Although darts are obviously a massive part of Flight Club as a venue, they are also establishing themselves as an all-round great hangout place with two fully stocked bars, an all-day menu with lots of sharing plates perfect for munching as you play, as well as weekend boozy events. And for any single folk out there, they also hold regular speed dating events - minus the awkward 'next' dings. 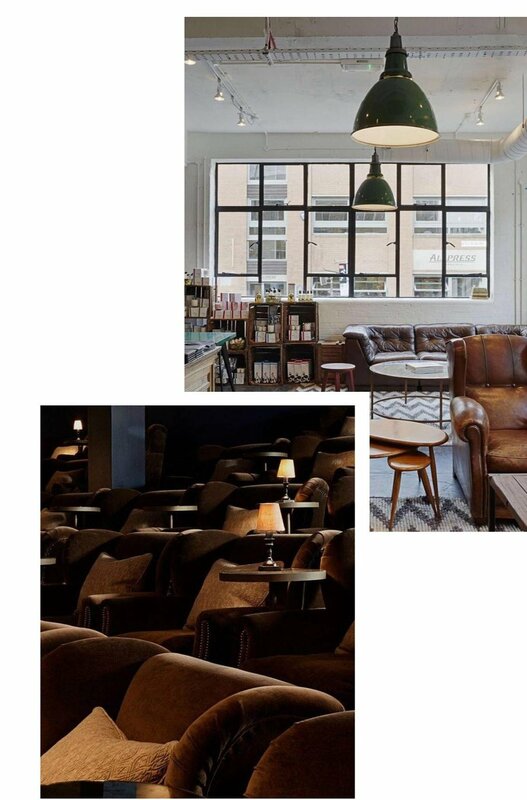 Based in a quirky complex made up of an artisanal barbershop (which is apparently a thing), a chilled-out cafe, and a chic beauty parlour, Electric Cinema is located in the basement of an old Shoreditch warehouse building. And as you can probably imagine, this isn't like any other cinema you will've been to. This snug little cinema, only holding up to 50 guests, exudes luxury. You’ll be sat in comfy, stand-alone armchairs (admittedly, not ideal for the first-date arm-over-the-shoulder move) and you will be provided with cushions and cashmere blankets to ensure your backside stays awake throughout the film, even if you struggle to. Playing current blockbusters, as well as cult classics, you’ll be spoilt for choice. Want the cherry on the top? Booze. The foyer serves all of the regular jaunts like popcorn and sweets, but if you're feeling a little bit more adventurous, Electric Cinema has an extensive cocktail menu. Getting to spend Sunday morning at Columbia Road Flower Market is one of the great privileges of living in London. Every Sunday morning - from about 4am - flower traders set up shop on Columbia Road and they flood the little street with colour. Flowers from every corner of the world bloom from trays, tumble from shelves and rustle in the breeze. Mouthy sellers shout about their offerings, luring shoppers over for a chat ‘n’ a browse and you can pick up armfuls of blossoms for next to nothing, and it’s a great reason to get out and about. Although some stalls and shops are open mid-week, I've learnt that Sunday's are definitely the day to go. Just look at all the colour!!! As well as the flowers, small art galleries sit next to cup cake shops, vintage clothes stores, English and Italian delis, garden and antique shops. There is also a wealth of great pubs, cafes and restaurants for you to enjoy after you've gone flower hunting. Although technically classified as a hotel, The Hoxton is so much more than that. When the only downside of a hotel / venue is popularity then you know you're onto a winner. In the 'lobby', the exposed brick work, roaring fires and comfy arm chairs give a warm welcome, whilst still remaining extremely contemporary. You'll notice that amongst the normal check-in/out situation, business meetings are taking place, as are coffee catch ups and well, because we're in Shoreditch, a screenplay is most probably being written on a MacBook Air somewhere in the vicinity. The ground floor is is taken up by the Hoxton Grill, which has managed to become one of the district’s liveliest after-work drinking and dining dens. The red leather banquettes and booths have a definite New York vibe, while Art Deco-esque chandeliers add a touch of glamour, and fireplaces either end plus squashy sofas keep things cosy. The best of all of the worlds. Plus, and as you'd probably expect, it's notorious for producing some damn good steaks. I really really hope you've enjoyed this roundup of a few of my favourite spots in Shoreditch. Make sure you keep them in mind for the next time you venture East. As always, if you have any questions or if you'd like any more recommendations, feel free to get in touch via Instagram or email.